Gallery of emotions for cosmetic facial features. In some cases not only sad but also joyful emotional expressions of a female face can seem ugly, that also can be corrected by means of cosmetic make-up or visual facial art. Sad eyes and quiet mouth seem glad as eyebrows express joyful emotions. The quiet mouth and joyful eyebrows seem dismal as eyes express sad emotions. Sad eyes and joyful eyebrows seem calm as the mouth expresses quiet emotions. Joyful ideas cannot change grief of eyes if in quiet feelings there is no pleasure. The person tries to think about happy, but desires are saddened by grief, and consequently sensual silent does not express feelings. 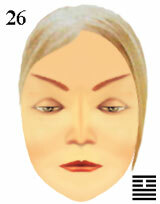 make-up physiognomic features of a female face.